Hidden illnesses can result in pancreatitis. Feline pancreatitis is an inflammation of the pancreas. It can be acute and come on suddenly, or it can be a chronic, lifelong battle. Educate yourself about the symptoms so you can help your cat feel better. The pancreas is an organ that is situated behind the stomach and part of the small intestine. It aids in sugar metabolism by producing insulin and produces enzymes that help the body digest nutrients. When there is a problem that affects the pancreas and it does not work properly, acute pancreatitis may result. If the problem is ongoing or happens several times, chronic pancreatitis may result. When feline pancreatitis comes on suddenly, it can result in a life threatening condition. 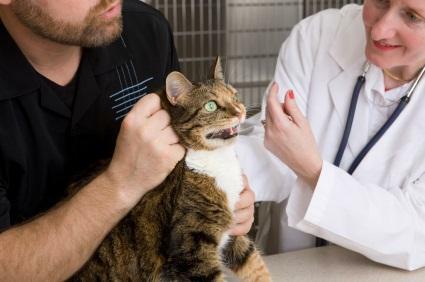 It is very important that you contact your vet immediately or take your cat in to an emergency clinic if you suspect that she may have feline pancreatitis. There are a number of things that can cause your cat to develop pancreatitis. The most common problem in a cat with acute pancreatitis is dehydration and an imbalance in her electrolytes. This will be assessed and dealt with immediately at the clinic. Your cat will probably be given an IV of electrolyte rich fluids. This will stabilize her and make her feel better almost immediately.The next step will be to control any pain that your pet may be experiencing. Pain killers will be administered either by injection or in the IV. The medications may make your cat groggy, but this is completely normal. If your cat is vomiting, she will be given medications to control that as well. Vomiting will cause your pet to continue dehydrating, and this ultimately can lead to more complications. Your vet will probably keep your cat off of food for a 24 hour period to allow her stomach to settle. Afterward you may be advised to feed a bland, low fat diet. If your cat refuses to eat, she may need to have tube feedings until she can eat properly again. Finally, the reasons for the attack of feline pancreatitis will be explored. If it was a response to a medication, your vet will want to change the medication to something else. Your pet will probably be monitored for some time to prevent future attacks. If the attack of feline pancreatitis was mild, the prognosis for a full, uncomplicated recovery is very good in most cases. If the cat has underlying diseases like feline diabetes then there can be some complications. One of the dangers of acute pancreatitis is that it can develop into chronic pancreatitis. This can lead to diabetes or pancreatic insufficiency. With pancreatic insufficiency, the food is not digested and the body is unable to assimilate nutrients. If this is the case, weight loss would continue. This can be controlled with a medication that replaces the digestive enzymes usually produced by the pancreas. While feline pancreatitis can be frightening it does not mean that your pet won't recover. Pancreatitis can be overcome if it is caught quickly and treated properly, and your cat can have many healthy years in front of her.